Cigarette Racing 46 Concept builds on fabled company's legacy. 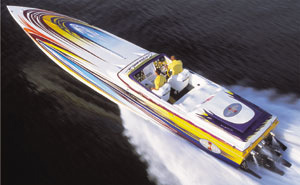 Since Skip Braver took control of Cigarette Racing in 2002, the businessman is credited with helping rejuvenate the venerable boat company. 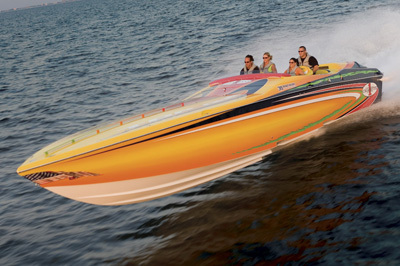 Taking a cue from the automotive industry, Braver has introduced several "concept boats," unique performance creations with eye-popping paint jobs and sophisticated technology. The concept has created a buzz for the company, and as any marketing manager will attest, positive buzz can be good for sales. 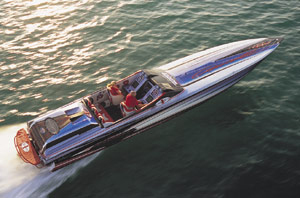 Cigarette Racing brought us American Muscle, a 46 Concept that made its debut at the Miami International Boat Show in February. Equipped with a pair of Mercury Racing's new HP1075SCi engines, the V-bottom is clearly aimed at the elite performance boater. And with a retail price of $989,000, the buyer will be someone with an elite bank account. The paint work on the 46-footer was stunning, a bold design that showed why The Art of Design in Elkhart, Ind., is one of the country's premier paint shops. 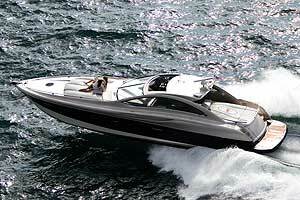 Though looks are important, it's the boat's performance on the water that keeps Cigarettes in demand. The 46 Concept thrived on the 1- to 2-foot chop we came across while running on Sarasota Bay. 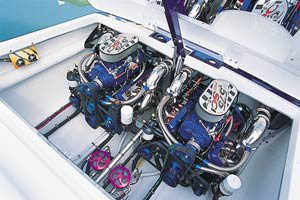 The boat featured the 1075-hp power plants, some of the first installed in any performance boat. The motors didn't disappoint, cruising at 80 mph at 4,000 rpm. It's at 80 mph where the hull was noticeably more efficient and the fuel economy improved (although it was still less than 1 mpg). A transmission problem on one of the staggered motors kept us from getting a top speed. 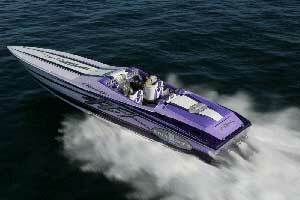 The manufacturer said the boat will run 115 mph and there is no reason to doubt it. Running the boat for photos earlier in the day, our lead test driver topped 100 mph and noted there was still more left in the engines. The motors were installed in a staggered fashion with the port one forward. The work in the engine compartment was breathtaking and a good indication why the builder can demand top dollar. On the underside of the hatch, Cigarette installed red plexiglass mirrors and installed lights in the compartment to showcase the hardware. Diamond plate was strategically placed between the engines and the stringers, and the bilge was finished to match the boat's paint job. The plumbing lines done in braided stainless were a neat touch. Custom touches continued in the cockpit, with dash panels painted to match the boat's exterior. There was a lot going on at the dash, but the builder tried to simplify it by grouping gauges by engine rather than function. Driver and co-pilot had complete gauge sets to keep tabs on the motors. Each station included color-matched SmartCraft System View 5000 screens and large Norstar GPS chartplotters. At the driver's spot, Cigarette placed the shifters to the left of the tilting wheel and the throttles were on the right. One feature that caught our attention was the mechanical indicators for the tabs. The indicators are pins that elevate from the dash, giving the pilot a precise reading of the drives and tabs at all times without having to look away from the water ahead for too long. Seating included two bolsters up front with power dropout bottoms and a rear bench that wrapped around into the gunwales. When the door slid open, it revealed a cabin that was fairly simple and built with poker runners in mind. Facing lounges gave way to a rectangular-shape berth with a single large cushion. On the forward-most bulkhead, there was a hatch that provided access to the nose of the boat. The hatch was upholstered and prominently displayed the Cigarette Racing logo. Other items in the cabin included stowage lockers on both sides of the walkway and a dedicated locker for a portable head. Cigarette also tucked away the custom stereo system with CD player in the cabin. The 46 Concept is one of many reasons why the Cigarette brand name has been rejuvenated. 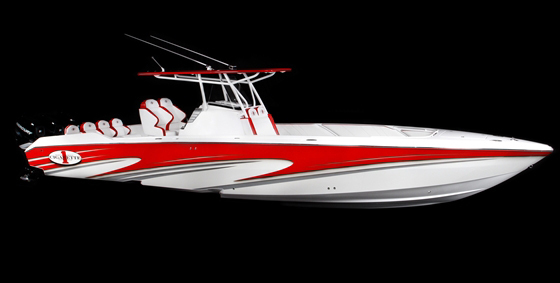 The V-bottom combines style and performance, something buyers expect from Cigarette Racing. 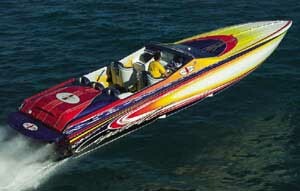 Editor's note: This article was part of a roundup that ran in the August 2004 issue of Powerboat magazine. Propellers Mercury Cleaver 17 1/2" x 33"